DECEMBER 28, 2018 – George and Ted Kougianos, co-owners of Brothers Deli in Peabody, celebrated the one-year anniversary of the restaurant’s return to Peabody Square this month. The Kougianos family co-owned the original Brothers in Peabody from 1986 to 1999 on the same site. 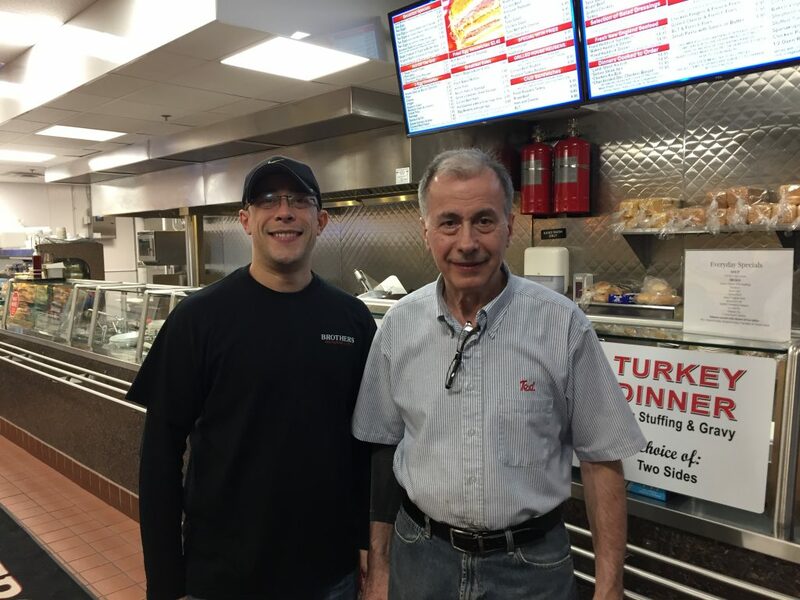 It moved to Danvers Square, but Ted, and his son, George, decided to return to Peabody last year to serve loyal customers at their 100-seat deli. The deli, which is open for breakfast, lunch and dinner seven days a week, features standard Jewish-style food, including corned beef and Reuben sandwiches. They’re also known for their turkey and lamb dinner plates, and Greek specialities such as spinach pie, moussaka, pastichio and chicken egg lemon soup. “We deliver and do big and small catering,” said George Kougianos, who like his father Ted, is a Peabody resident and is dedicated to helping to revitalize Peabody Square. The affable father and son can be found most of the time behind the counter serving customers. George, who graduated from St. John’s Prep and Salem State, grew up working at Brother’s and is proud to continue in his father’s footsteps. “It’s a childhood dream to come back here to Peabody Square and open a deli,” he said.